I couldn't resist taking this screengrab. I know these are probably not the final color choices, but it's fun to think about. Despite the fact that these aren't necessarily the final color options, I thought I'd dust off this old topic. What does everyone think of the colors? 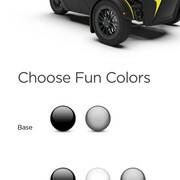 Personally, my favorite is yellow-on-black. Though, I have to say, I'd prefer some base color options that are actually... colors. I like yellow too as the most highly visible color. I’m also considering orange or white. 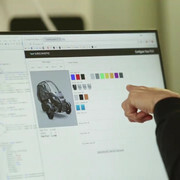 Note: When Arcimoto invites me to order the Evergreen I may request a credit on the California Doors (1/2 Doors) and pay the difference when the In-land Northwest Doors (full doors) are available. ‘California Dreamin’ playing softly in the background. I am having a tough time deciding on this. I really want to see what a silver framed one actually looks like.